From Left To Right: Ryoga, IV, Shin, Ko-Ki, Reno. ViViD’s music incorporates a racing energy provided by fast pace compositions and sprinting guitars. Their encouraging and optimistic melodies match their bright and youthful visual style. 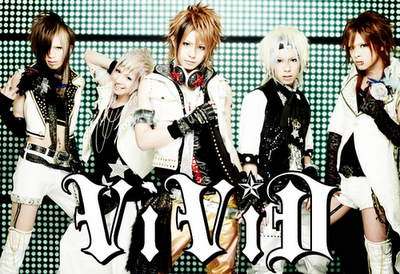 Formed in March of 2009, ViViD recently signed with PS COMPANY’s sub-label, Indie PSC. Their line-up consists of vocalist Shin guitarists Reno and Ryouga, bassist IV and Ko-ki on drums. [KPOP] T-ARA to Debut in Japan! But they didn’t even debut in Korea that long ago T_T. But on the brightside, more interactions with Supernova! Six-member girl group T-ara will be making their Japanese debut in March, according to their agency Core Contents Media on Tuesday. The girls will fly into Japan on Sunday for a five-day stay during which they are scheduled to hold a press conference regarding their single album as well as shoot a commercial with boy band Supernova. Both K-pop idols were cast for the commercial by a company in the restaurant business, said to be highly popular amongst youngsters, which holds numerous chains throughout Japan. Core Contents Media said the singing groups will each receive a minimum guarantee of one billion won, equivalent to about 87 thousand dollars. The girls and boy band Supernova had collaborated on the digital single “TTL (Time to Love)” and “TTL Listen 2″ which topped music charts during the latter half of last year. T-ara took their first solo win with “Bo Peep Bo Peep” from their first full-length album early this year, taking the top awards on music programs by Korea’s major broadcasters. [KPOP] After School Comeback in March! OMG seriously? March and April are gonna be crazy months. But seeing as After School is my favorite girl group, i’m seriously looking forward to it! After School’s leader Park Kahi, recently had an interview with ISPLUS and it was revealed that towards the end of this month, Kahi will be cutting down on variety show appearances to prepare for After School’s upcoming mini-album. In addition, After School who was awarded the title of K-pop’s rookie of the year at the Billboard Japan Music Awards back in January, has plans to enter the surrounding Asian markets. SNSD, T-ara, KARA and now After School… the new year is starting off with a Big Bang! Children of Empire (ZE:A) ended their debut song’s “Mazeltov” promotions on the music programs last weekend and they’re currently working on the new song. ZE:A debuted in 2010, although the group was supposed to debut in 2009 together with BEAST and MBLAQ . However, they were already known from Mnet’s “Children of Empire” reality show. They also performed 50 guerilla concerts, during which they improved their skills on stage. In addition, as soon as they debuted they appeared in mobile phone CF, gaining a lot of popularity. With ZE:A’s new song, BEAST’s announced comeback and MBLAQ’s new album in April, we can expect a fierce male idol group battle in the upcoming two months. [KPOP] T-ARA ‘I Go Crazy Because of You’ Full Track Released! ‘Crazy Because of You’ is a dance song which was written by WheeSung and composed by hit maker Jo YoungSoo. They will have 12 back dancers for their unique choreography. MV Teasers, Photos, and ‘I’m Really Hurt’ under the cut! A hot new 5-member band called Sponge Band will be debuting soon. And with a name like that, who could possibly hate them? With all due seriousness though, they sound really good – kind of an F.T Island vibe, but what’s even more interesting is that they’re a co-ed group! There’s definitely a lack of co-ed groups in k-pop lately, so I’m pretty excited about this one.